If you were ever looking for a concrete example of why the rest of the country has such a grand time making fun of New York sports fans, you really couldn't do much better than this supposed "the Knicks are gonna get Dwight Howard!" story. The Knicks have spent the last decade injected into every conversation about every superstar who so much as coughs about his current situation, and the media around here has fallen all over itself attempting to chronicle, or even create, those potential Knicks–superstar matches. (The jerks.) This has led not only to the Isiah era — in which aging "stars" collected their NBA pensions while firing up errant three-pointers and eating french fries — but even today's Knicks, who have three legit stars who still haven't figured out how to play together ... and not much else. It's basically tradition: When the Knicks aren't currently fun to watch, whip up a rumor about them acquiring a player who is! Preferably more than one. 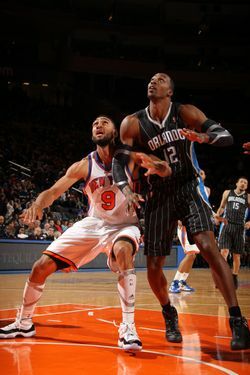 So, as if on cue after a six-game losing streak: Reported — ahem — by ESPN's Stephen A. Smith, late of Cheesy Doodles, the story now is that the Knicks might trade Tyson Chandler and Amar'e Stoudemire for Dwight Howard. (We find it hilarious that the headline to that story includes Smith's initials in the headline, as if to wink and say, "You get it, right?" Of course, in order for Deron Williams to come to the Garden, the Knicks would need to restructure Carmelo Anthony’s contract and try to get Dwight Howard to take less than the maximum. Would that be possible? Well, it might be difficult but certainly possible if Carmelo, Dwight, and Deron are willing to take a little less in order to form an absolutely terrific trio. Yeah, it's fairly common in professional sports for players with no geographic ties to a particular region to rush there to play for teams that have lost six games in a row. This is why they hate us, you know.